Adam Berkle, Dan DeSalvo and Mark Cooper were expected to be three of Bowling Green’s top scorers this season. The three finally are starting to score as expected. 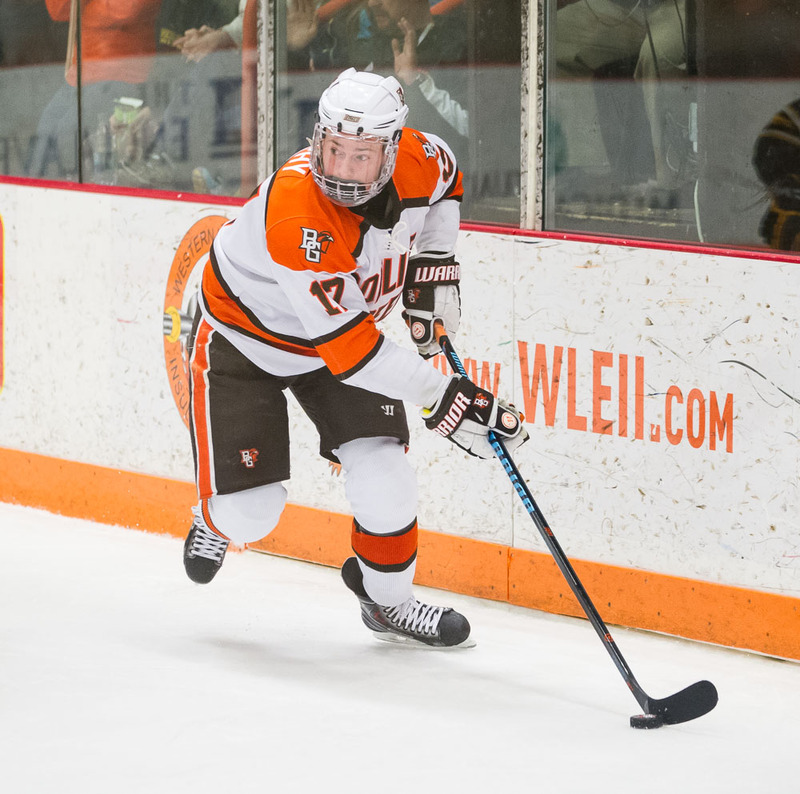 They all played well last weekend when the Falcons posted a 3-2 (overtime), 4-1 sweep of Northern Michigan in the first round of the Western Collegiate Hockey Association playoffs. BG, ranked ninth and 23-10-5 overall, faces No. 4 Michigan Tech (28-8-2) in the semifinals of the WCHA Final Five Friday night at 5:07 in St. Paul, Minnesota. The three combined for a goal and six assists against NMU, although they didn’t play on the same line. Entering the Tech series, only Berkle, who is tied for fourth, is in the top five on the team in points. Freshmen Tyler Spezia, Mitch McLain and Brandon Hawkins, and sophomores Kevin Dufour, Pierre-Luc Mercier and Matt Pohlkamp have handled the bulk of the scoring among the forwards. The defense corps has chipped in offensively, too. “It means everything,” BG coach Chris Bergeron said of the recent scoring by Berkle, DeSalvo and Cooper. DeSalvo and Berkle, who are on the same line, are seniors. DeSalvo is a center, and Berkle plays right wing. DeSalvo has a goal and four assists in the last four games. Berkle has a point in 10 of the last 17 games, totaling three goals and eight assists in that span. They’ve combined for 10 goals and 31 assists this season. “(Berkle and DeSalvo) know the number of games they have left here are limited, and they want to go out on a high note,” Bergeron said. Cooper, a junior left wing, has six goals and 13 assists this season, including four goals and four assists in the last seven games. THREE OF A KIND: The WCHA is hoping to have three of its teams earn spots in the NCAA playoffs. According to U.S. College Hockey Online, regular-season champion Minnesota State and runnerup Tech have clinched at least at-large berths, and the Falcons could earn an at-large berth as well. All three teams are playing in the WCHA Final Five where the champion earns an automatic berth to the NCAAs. Ferris State is the other semifinalist. The WCHA often is perceived as one of the lowest of the six NCAA Davison I leagues in the country. “I really felt all along we had several teams that could compete at the highest level,” said Bill Robertson, who is in his first season as commissioner of the WCHA. “We’re seeing the fruits of that right now. ATTENDANCE: Although Robertson declined to say how many told tickets have been sold for the weekend, he’s hoping to draw 6,000-7,000 fans each day. The Xcel Energy Center, home of the NHL’s Minnesota Wild, has a capacity of 18,568. Last season’s Final Five in Grand Rapids, Michigan had an announced three-game attendance of 11,162, a number believed to be overly generous by most observers. The event last season required a separate ticket for all three games, but one ticket is good for both semifinals this season. Last season, the semifinals were at 2 p.m. and 7 p.m. This season, they’re at 5:07 p.m. and 8:37 p.m.
Tickets are $69 for the weekend or $35 per day. Student tickets, available at the Xcel box office, are $20. The WCHA will have a kickoff event Thursday from 6-8 p.m. at the Mall of America in Bloomington, and a Fan Fest Saturday from 4-7 p.m. at the arena. SPECIAL TEAMS: The Falcons still lead the nation in penalty-killing at 89.7 percent, but they’ll face a difficult test from Tech. The Huskies’ power play ranks ninth nationally at 20.9 percent. The BG power play is fifth in the WCHA at 16.4 percent, while Tech’s penalty-killing is seventh in the league at 84.7 percent. PENALTIES: BG is the fifth-most penalized team in the league (13.2 minutes per game. Tech is sixth at (13.0 mpg). COMPETITION: The WCHA is competing with the National Collegiate Hockey Conference championship for attendance this weekend. The NCHC is playing at the Target Center in Minneapolis. The NCHC semifinals match No. 1 North Dakota against No. 18 St. Cloud at 5 p.m., and No. 5 Denver against No. 6 Miami at 8:30 p.m. The championship is Saturday at 8:30 p.m., with the consolation game at 4:30 p.m.